Press about us | Project "RUSALCA"
"A Look Back at the 2009 RUSALCA Expedition"
In August and September of 2009, scientists from the United States, Russia, and South Korea set off on the Russian-American Long Term Census of the Arctic (RUSALCA) expedition through the Bering Strait, a region that is particularly sensitive to global climate change. That summer, Arctic sea ice had receded to its third-smallest extent on record, allowing the expedition to travel 400 kilometers farther north than the first RUSALCA expedition in 2004. As a result, the scientists got the opportunity to study the water, sea life, and ocean floor in areas of the Arctic Ocean that are rarely free of ice. The photo at top left shows the Russian Research Vessel Professor Khromov as it moves through drifting pieces of thin ice on its way toward the solid ice pack. 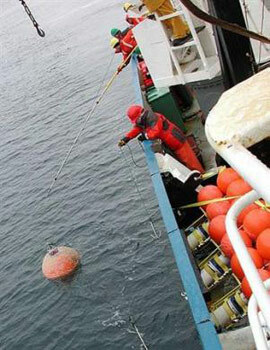 During the cruise, the expedition crew updated or replaced equipment on eight buoys that are moored to the seafloor across the Bering Strait between Alaska and Russia. 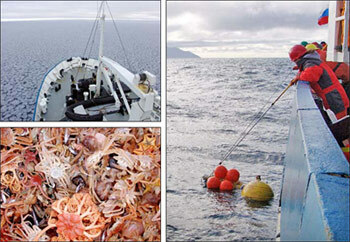 The photo on the right shows scientists recovering one of these buoys. Data from instruments on the buoys revealed that water moving into the Arctic from the Pacific Ocean is warming and freshening the waters of the Arctic, likely contributing to the long-term trend of diminishing sea ice cover. To perform their census of sea life, scientist collected samples of benthic (bottom-dwelling) organisms by dragging a heavy net called a beam trawl along the seafloor. The photo on the bottom left shows the unsorted contents of a benthic trawl. As the Arctic environment continues to undergo changes such as loss of sea ice and warming of seawater, scientists are keeping an eye on species in the region to see how their populations respond to changing conditions. "Former Cold War foes team up to probe warming seas"
Woodgate, of the University of Washington's Polar Science Center, had much to do in a short time, pinpointing undersea locations of eight data-gathering moorings on the U.S. and Russian sides of the strait, electronically coaxing them to the surface and sinking new ones that will be anchored for a year. It's exacting work that must be done quickly for readings to be useful to her and her colleagues on a joint U.S.-Russian expedition to gauge the impact of climate change on the far north waters between the former Cold War foes. When an onlooker wandered too close to the action during a deployment in choppy seas off the Siberian coast, the British-born scientist hastily handed him used packaging from a piece of gear and said, "Here - do something with this." Resembling strings of beach balls, the moorings provide precision measurements of currents, temperature and salt content. Some even record whale sounds for the mission, called RUSALCA, or Russian-American Long-term Census of the Arctic. RUSALCA, which in Russian folklore is the name of a female water nymph, has uncovered growing evidence of warming and its effects where the Pacific and Arctic oceans meet. Organized by the U.S. National Oceanic and Atmospheric Administration and Russian Academy of Sciences, it does so while balancing the objectives of two countries with growing interest in securing their resource-rich Arctic territories as open water make them more accessible. The area is a crucial piece of the climate change puzzle. "I see the Bering Strait as potentially a trigger for ice melt," Woodgate said, while uploading the moorings' data on the Russian research vessel Professor Khromov. The need for complete information, from Alaska's coast to Russia's eastern tip, makes bilateral cooperation important. Without it, "You're toast," she said. Woodgate was among about 50 scientists from the United States, Russia and other countries aboard the Khromov for six weeks in August and September, studying water and sea life in the Bering and Chukchi seas and Arctic waters well north of Wrangel Island off Russian's northeast coast. It's difficult to imagine when cold, gale-force winds and heavy seas buffet the ship in late summer that warmer and fresher water flowing through the strait into the Arctic may be pushing the sea ice edge back. In 2007, it retreated a record amount, startling scientists. This summer, the ice receded to its third-smallest area in recorded history, according to the U.S. National Snow and Ice Data Center. It is a vicious cycle, scientists say. Once the ice shrinks, open water absorbs more of the sun's heat, melting more ice. "There is no debate that the atmosphere is getting warmer, and perhaps the Arctic the most," said Aleksey Ostrovskiy, one of the mission's Russian coordinators and a former diplomat. "That is why scientists have chosen this area for their research, because it indicates the change very well." It was tough convincing Russia's defense ministry and other authorities that allowing U.S. scientists and their equipment into the country's waters would not compromise national security, he said. Their movements are monitored closely. Since the maiden RUSALCA voyage in 2004, researchers have identified species of fish and other organisms such as crabs that had never previously been able to survive this far north. "It is a very interesting question about what happens out there where the ice has normally been all the time and now is retreating," said Terry Whitledge of the University of Alaska Fairbanks, RUSALCA's science chief and one of oceanography's elder statesmen with nearly 90 cruises under his belt. Still, retreating ice spells opportunity for the mission. This summer, ice maps showed the Khromov may be able to travel further north in the Arctic than in previous cruises, allowing more detailed research before the scientists return to Nome, Alaska, in late September. As countries prepare to meet in Copenhagen in December to hammer out a deal on carbon dioxide emissions, scientists aboard the Khromov said limiting the gases most often blamed for global warming will help to better predict what changes are happening and how to adapt to them. Kevin Wood, whose scientific specialty is compiling and analyzing climate data going back hundreds of years, said all evidence points to a warming earth. "The other part of that argument is: Is it CO2 or is it natural variability? How much does each contribute to the trend? Is there anything we can do about it?," said Wood, who is also a veteran mariner. "My view is, well, CO2 is going through the roof. We know it's going to have an effect, and whether it's one degree or eight degrees, it's going to be something and it makes sense to try and put a curb on it." I was asked to describe my role in the Russian-American Long-term Census of the Arctic (RUSALCA) project. In general, I coordinate between both sides and that obviously includes a lot of translations. The first thing that comes to mind when talking about translation is the story of the Tower of Babylon. Those guys definitely experienced a lack of interpreters and this ruined their project. I am not a professional interpreter, but sometimes during the RUSALCA operations I hear pleasant thanks and compliments for my translations. I always think that, perhaps, it is just polite gesture of courtesy. Was the translation really good? Well, in any case it is nice to hear and see that I continue to be useful to the project. The English language was always an important addition to my work. It all began in the 1960s when my parents hired a private tutor for me so that I could learn better English. At that time I never realized what a powerful tool I was getting in my hands – the English language. It was just fun to better understand the songs of the Beatles or American folk songs. Some of these songs were printed in the journal America – my little window to the romanticized world far away. I wanted to see it and decided to become a marine geophysicist so that I would be able to travel a lot. Meanwhile I thought that my English was good and even slowly progressing until I met an English-speaking tourist in the street and realized that I could not understand him. That was a shock. During my Moscow State University years I started to work for free as a guide in a tourist agency; that helped my English a lot. Still, I felt terrible when my communications were too slow. At that time I developed my rule number one in translating: it is better to speak fast than be grammatically correct. After the University, I had 20 years of a classical academic career in the Russian Academy of Sciences’ Shirshov Institute of Oceanology. There were dissertations, publications and marine expeditions, two years all together at sea and many exotic places, many countries, many English speaking people, many unknown words. There I developed my rule number two: if you have forgotten or do not know a word for translation, just quickly explain it in other words inviting a person you are talking with to guess it. It will prevent the loss of a contact during conversation. In perestroika time I won a Alexander von Humboldt Fellowship in Germany and received a basic level of the German language. Unfortunately I had not time to get it to the working level, probably, because everybody communicated in English in my host institute. Then I won the George Soros fellowship when I was back in Moscow. In that position, I made a discovery of a new tectonic belt under Baltic Sea, published a book of all my research results and then had the feeling that I am ready to try something new. In 1998 I signed a contract with Russian Foreign Ministry to work in the Russian Embassy in Washington, DC as a Science Counselor. It was like “landing on another planet” for me, but it was an English-speaking planet. A question of the Ambassador after arrival: “What do you see as your goal here?” My answer: “Promotion of Russian-American cooperation in science and technology.” Ambassador’s reaction: “Good.” Then, more than six years of intensive work, meetings, traveling, translations. My English was getting better though my memory was getting worse. Well… I hope these two processes compensated each other. I was trying to help to move ahead several Russian-American projects in addition to supporting the existing ones, but the political climate was not cooperating. I wanted real results. At that time NOAA started to contact the Embassy trying to reestablish joint US-Russia work in the oceans on climate research. The process was going too slowly. The global warming could have ended and changed back to the ice age before something was going to be accomplished. There were a lot of misunderstandings on both sides. Then we decided to bring in the Russian Academy of Sciences and to try a public-private partnership approach to foster collaboration in the Arctic. It took some effort to explain that this approach would be a win-win project, but it worked and the project later called RUSALCA started. During this process a translator had to be even more interpreter and the rule number three came out to be: instead of translating word after word (that never works even when professionals are doing this) it is better first to understand what one side wants to say and then to explain it to the other side. Of course, I try to use as close words as possible, but the priority is to explain and deliver the meaning of a message. I know that very often even when people speak the same language, they often do not understand each other. What can one say about those who speak different languages? If these people happen to be different countries’ presidents, misunderstanding may cause war! Yes, my role is much more modest; I only try to diminish potential contradictions and to keep the RUSALCA project going on efficiently. I am not doing scientific research anymore, but I am happy to help facilitate it. After all, scientists are also interpreters – from the language of nature to the language of people’s knowledge. "Tasty find for Russian researchers in Alaska"
You have to be creative when you’re a Russian scientist, bad weather is preventing your research ship from picking you up for your expedition and you’ve got time to kill in Nome, Alaska. 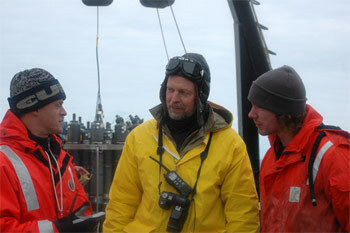 Such was the case for a group waiting to begin a joint mission with U.S. researchers in the Bering Sea in late August. But a side trip into the rolling, lichen-covered hills around Nome, the one-time gold rush town on the Alaskan coast, proved to be more than worth their while for the prize they stumbled upon — mushrooms. A hillside was spotted with the large, red-topped variety Russians crave in soup or fried with onions and potatoes. 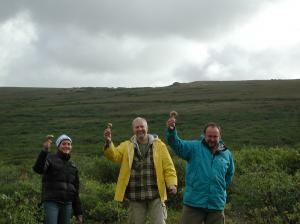 Thrilled, the team fanned out to gather armfuls of the fungi. The scientists are part of the RUSALCA expedition, brought together by the Russian Academy of Sciences and U.S. National Oceanic and Atmospheric Administration. They will spend the next month and a half studying the impact of climate change on the water, air and organisms in the body of water between the two countries. But today is about mushrooms, and there’s no concern whatsoever about anyone mistakenly plucking a poisonous one. "Russians know what these mushrooms look like," said Elizaveta Ershova, a zooplankton specialist. The plan is to give them to the chefs on the research ship Professor Khromov, after it finally enters port to load people and gear, to whip up a dinner with the delicacy. "There’s a similarity to the gold rush," Aleksey Ostrovskiy, an expedition coordinator, said of the excitement of discovering the mushrooms. "We just don’t have them like this in the Moscow area." "Environmental research in an age of Arctic sovereignty"
In an age of angst about security and Arctic sovereignty, it’s no mean feat piecing together an oceanographic expedition involving scientists from the United States, Russia and elsewhere and launching the whole affair from a northern U.S. port. In the choppy waters of the Bering Sea just off Nome, Alaska, the Russian research ship Professor Khromov is waiting to come in to port, where strict security protocols will be adhered to under the watchful eye of U.S. authorities. As many as 50 scientists are teaming up for two legs of study in the Bering Strait and northward in August and September, and those without special U.S. Transportation Security Administration clearance cards will be escorted aboard by people designated to do so. No exceptions. The mission is called RUSALCA, or Russian-American Long Term Census of the Arctic. During the voyage, the multinational team will gather data on water, air and lifeforms in the only place where the Arctic and Pacific oceans meet. It’s a follow up to the initial RUSALCA expedition in 2004 and the data will be gathered and compared to help gauge the impact of climate change in the region where the former Cold War foes previously studied each other’s movements. 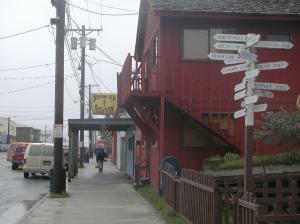 But before any of that happens, last-minute preparations are taking place in Nome, the town best known as the finish line for the Iditarod dogsled race. The town’s no-nonsense harbor master, Joy Baker, must be sure that all security issues and logistics are dealt with for the passengers and their thousands of pounds of high-tech gear. Also, conditions on the Alaskan Coast — the region is being hit with wind, rain, rough water — have to improve for the Khromov’s safe loading. Due to the alarming trend in the reduction of Arctic sea ice cover, particularly in the Chukchi Sea located between the Russian Federation (Chukotka) and the United States (Alaska) and northwards into the High Arctic, the Pacific Arctic is arguably the fastest changing region in the world’s fastest changing ocean. Unfortunately, without baseline information about Pacific Arctic oceanographic and ecosystem conditions, accurately documenting the extent of fundamental ecosystem changes is impossible. The collection and integration of biological, physical, and chemical information during the RUSALCA expeditions are designed to gather information where the summer ice edge is rapidly advancing northwards and these observations will provide a major step toward obtaining the foundation of information necessary for detecting ongoing and future change in this delicate ecosystem. The RUSALCA mission was developed in 2003 after several years of U.S. government to Russian government discussion about how our two nations could work together in the Arctic waters that straddle the Russian-U.S. border. We, as the "gatekeepers" of this region of the Arctic, have a responsibility to observe changes, and explore together the Arctic world that we share. Our goals were at once simple (technically) and complicated (diplomatically). But what we as scientists shared were the goals of understanding and exploring our mutual world and gathering information needed to predict the global changes that might be consequences of the changes in "our" side of the Arctic. We designed a program that would include both Russian and U.S. scientists who worked together on various teams, such as those who examined the biogeography and diversity of fish, Arctic water column species, seafloor and oceanographic fluxes, and from the tiniest microbe to the largest whales. The questions were and are still sometimes very basic. What lives here? What is migrating there? How are the currents changing through space and time? How much heat is entering the Arctic through the Bering Strait? What is causing the thinning and great reduction is sea ice cover in the Pacific Arctic? How can we even address Arctic biodiversity changes until we know which creatures populate the Arctic? How can we build on our collaborative efforts to design a more robust Arctic Observing System, one that extends outwards and northwards of the Pacific Arctic to all of the Arctic regions? Above all, the issues that drive much of our collaboration is that because the changes in the Arctic are so rapid, time is of the very essence of our work. We cannot afford to wait another year to address these issues. The original founders of the RUSALCA program in 2003 were the Russian Academy of Sciences and NOAA: (a collaboration between the Arctic Research Office and the Office of Ocean Exploration). Since that time funders and participants hail from not only these agencies but in Russia, the Russian Federation Navy, Roshydromet, the Ministry of Natural Resources and the private company “Group Alliance”. On the U.S. side, the National Science Foundation has joined the efforts by helping to support the "RUSALCA" Bering Strait Moorings, which are serviced on an annual basis. Through the years, the RUSALCA program has used three different vessels, the Professor Khromov, the Sever, a Russian Naval Hydrographic ship and the R/V Lavrentiev. We anticipated that we would repeat the sampling of our stations on a four-year interval, extending them where the sea ice melted. Yet in 2004 we did not anticipate exactly how far back the ice would melt. In 2009 we were able to take the Research Vessel Professor Khromov up to 77 ° N, about 300 nautical miles north of our 2004 stations and we were able to take the furthest north trawl for fish in this region of the Arctic. We traversed the waters far enough west to reach the East Siberian Sea (what the U.S. calls the Western Arctic, Russia calls the Eastern Arctic. This is why the RUSALCA mission has begun to call this region the Pacific Arctic). This year we have commenced observations for ocean acidification in the area of extreme sea ice cover change. During the six years since we began RUSALCA, we have seen an evolution of the science and diplomatic protocol designed to assist with transfer of data and samples between our two countries. RUSALCA is an excellent example of how working together across borders leads to far greater scientific outcomes than either one of our countries could have achieved by themselves.